Galloway Township is holding their 7th Annual Shredding Party on Saturday, May 17th from 9:00 am to 1:00 pm. 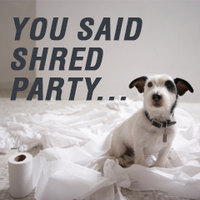 The shredding party will be held at the Municipal Complex located at 300 E. Jimmie Leeds Road. Township Residents only have to pay $2.00 per box. Unlimited amount of boxes. Atlantic County Residents pay $5.00 per box. Proof of Residency is Required. No Businesses. No need to remove paper clips or staples. For more information call Community Services at (609) 652-8657. Information provided in the Community Services Spring 2014 Bulletin.